Have you ever wondered what is behind the “low in fat” and “low in sugar” labels you find on many foods? You might be astounded what hides in some foods, even those that are organic and sold as the better, healthier choice. The other day I was at a health food market with my mom and her boyfriend. We bought all the food we needed and then decided to grab something to eat. While we were eating, I noticed mom and boyfriend had their food with what looked like a very healthy drink: it had chia seeds in it, topped of with some fancy concentration. As my mom’s partner was drinking it drink, he said to me, “you know, I got this drink because it’s healthy and it has very little sugar in it” (people apparently become self-conscious about their food choices around me). I took the bottle and checked the sugar content: 14 g per serving and 2 servings were in the bottle. Not only my mom and her bodyfriend, we all were shocked that a drink that barely tastes sweet has so much sugar in it. Imagine how much sugar a drink that actually tastes sweet has. Nowadays even the healthy organic foods are loaded with sugar, what a shame! Somehow people assume that if a product is organic, it’s always healthy, but the reality is far from that. Today sugar is one of the main ingredients in food, even the foods where you suspect it the least, but if you check the label it’s gonna be there. A lot of times when we buy products that are advertised as “fat-free” or “sugar-free”, we tend to think that by buying these we are wining the obesity battle. But have you ever wondered how a product that naturally has fat or sugar in it, can all of a sudden be free of either and still have taste? Thank the science of processing: For food to become free of fat and still taste edible, the fat is removed and then tons of sugar are added to it, as otherwise you would be eating cardboard. Therefore, even though your formerly high-fat food is then fat-free, it can still have tons of calories. There simply is no such thing as a free lunch. 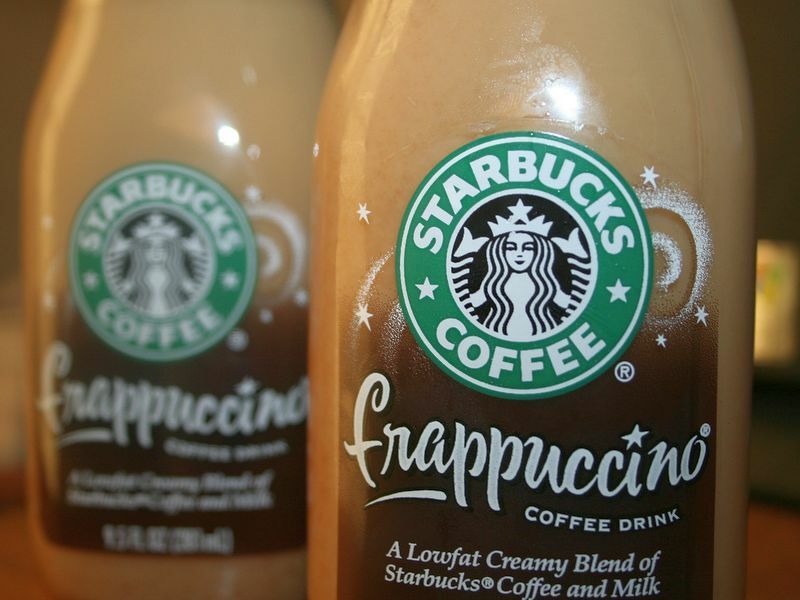 "Low fat" frappuccino: And where does the taste come from? If you are buying something that says “sugar-free ” on the label, then what it means is that either the sugar was replaced with fat or the product uses artificial sweeteners instead of sugar. And the problem with them is that many people think the artificial sweeteners save them a lot more calories than they actually do. How many times have you seen people with loads of junk food and a diet soda to gulp it down? I also believe that artificial sweeteners make you crave sweet stuff more badly. Don’t believe that just because something is organic, you can eat tons of it. When I think about organic sugar, for example, the first thing that comes to my mind is: “sugar is sugar”. The word “organic” in front of it means nothing, because it’s not like your body will recognize the difference between organic and regular sugar. It consists of the same simple carbohydrates and organic sugar will add the same empty calories as conventional sugar does. The only real difference is the price, because the organic label will charge you more. The trick is to always check the label: if the food claims to be low in sugar, check the amount of fat or if there are artificial sweeteners in it. On the other end, if a product says its low in fat, check how much sugar is in there. Don’t believe the slogans, check the calories. Finally keep in mind that not only sweets have sugar added to them. It is also done with regular foods such as bread, soup, beans, cottage cheese, lunch meats etc. Pictures courtesy of Matt MacGillivray and “yankara“.